Spectrum Noir pens are alcohol ink based markers which have been designed specifically for crafters, but these affordable markers are also great for beginners, students and hobby artists alike. Each pen is double-ended, with a broad chisel nib for large area fills and a fine bullet tip for detailed work. 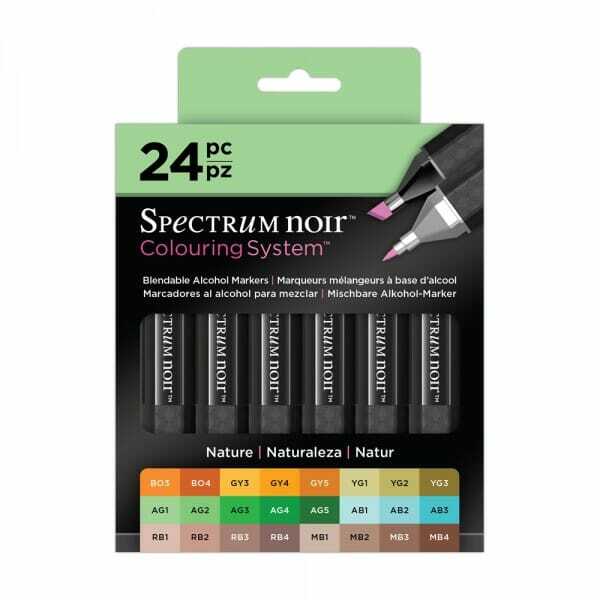 Spectrum Noir marker pens are available in 168 colour shades including a colourless blender. The colours blend seamlessly, and can be mixed or layered over each other. For stunning results use with Neenah Classic Crest Card, this is perfect for use with alcohol based pens. These fast drying, alcohol based markers are acid-free and non-toxic, and the coloured ends of the pen allow for easy colour identification. The image colour has been reproduced as accurately as possible. This new launch of Spectrum Noir Markers now have an ergonomic hexagonal barrel which has been designed for greater comfort when colour. Each of these markers now have a unqiue non-slip rubberised grip. Customer evaluation for "Spectrum Noir 24 Piece Pen Box Set - Nature"